All are welcome, $10 donation to the church happily accepted. "Big Bands Do the Classics" with the Grammy Award-nominated Harmonie Ensemble/New York, Steven Richman, conductor. 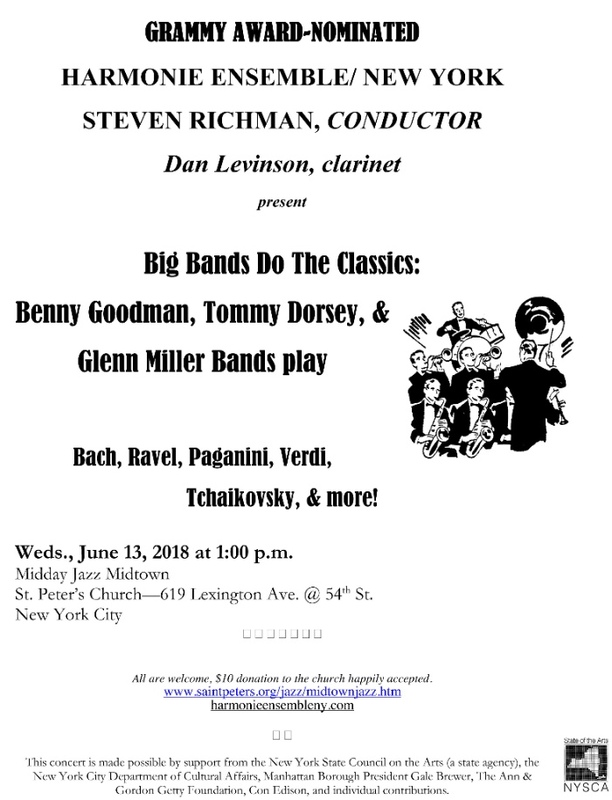 Presenting a one-hour concert of Swing Era big band arrangements based on classical themes. The program will include "Bach Goes to Town", "Caprice XXIV Paganini", "Let's Dance", and "Bolero", originally played by the Benny Goodman Orchestra, as well as Tommy Dorsey's "Song of India", Glenn Miller's "Anvil Chorus", Les Brown's "Bizet Has His Day", Claude Thornhill's "Hungarian Dance", and other selections. This concert is made possible by support from the New York State Council on the Arts (a state agency), the New York City Department of Cultural Affairs, Manhattan Borough President Gale Brewer, The Ann & Gordon Getty Foundation, Con Edison, and individual contributions.